We have created a garden calendar to help you understand when to use different growing media, soil improvers, mulches and feeds from grow your own to composting. What we haven’t done is create a calendar of everything you need to do in the garden throughout the year. To be honest BBC GARDENERS WORLD do an excellent job on what to do each week, so we thought you would appreciate the link. You should have ordered by now! Seed potatoes should be stood in a frost-free place to chit. Old egg boxes are ideal for this. Sow early crops in greenhouse e.g. onions, herbs, lettuce. to produce a fantastic selection of grow your own vegetables and herbs. If you haven’t done your winter digging now is the time to work in Soil Improver, Organic Garden Compost, Farmyard Manure and, for light soils, Chicken Manure Pellets. Even in the wet, tubs can dry out. Plant spuds indoors in Organic Vegetable Compost. If weather and soil permit, sow parsnips with radish. Radish will grow quicker remind you where the parsnips have been sown. Sow tomato, sweet pepper and other growbag crops, plus leeks, onions and early salads and green vegetables using Seed & Cutting Compost or John Innes No. 1 Compost. Fork Enriched Top Soil over and work in Organic Garden Soil, Organic Garden Compost, Organic Farmyard Manure or Chicken Manure Pellets. After planting shrubs etc, apply mulch or bark chips – saves work later in the season, reduces chances of weeds germinating, reduces evaporation and gets worms working for you! It’s not to late to plant up tubs etc with primroses and other spring flowering plants for a splash of colour. Use Multi Purpose Compost with added John Innes. Look to pot up any self-sown seedlings. For tiny seedlings, Use John Innes No.1 Compost in seed trays or cell trays. For stronger seedlings, use Multi Purpose Compost, Multi Purpose Compost with added John Innes or John Innes No. 2 Compost Potting in trays or small pots. Pick Brussels sprout tops for Spring greens. Harvest purple and white sprouting broccoli, kale and other winter greens. Line a runner bean trench with a minimum of 10cm of Soil Improver – this will hold water and boost your crop. Spring is the next best time after Autumn to create a new lawn – if the ground is not too wet. Use Organic Garden Soil – provides a long lasting nitrogen source, nutrients, humus and water retention. Sow tomato, sweet pepper and other growbag crops, plus leeks, onions and early salads and green vegetables using Seed and Cutting Compost or John Innes No. 1 Compost. Feed roses, borders, hedges, trees and shrubs with Chicken Manure Pellets. This ensures they have a good kick start of nutrients – work in with a rake, hoe or fork. Also a good time for planting – use Ericaceous Compost for lime hating / acid loving plants and Organic Farmyard Manure for other plants. Mulch Azaleas and other acid loving plants with Ericaceous Compost then Bark Chips. A great time to mulch those ornamental areas. Mulch other shrubs etc with bark chips. A good month to apply Organic Lawn Dressing – rich in slow release nutrients. A well fed lawn helps reduce moss and weeds – more grass means less space for them to work their way in. Plant evergreens and conifers – best planted April or September. They will need constant watering until they are well rooted. Clear remnants of winter vegetables to brown bins or compost heap. Lift last leeks and heel them back into a corner of the vegetable patch, where you won’t be replanting straight away. Time for vegetable and herb sowing. First prepare the soil using Organic Garden Soil. Use Enriched Top Soil and/or Organic Vegetable Compost if you are creating a new raised vegetable bed. Grow your own tomatoes in Multipurpose Grow Bag or Fruit and Vegetable Planter under glass. Plant them now!!!. Continue sowing seeds, partly to enjoy a succession of lettuce and other salads. Don’t be tempted to plant Summer bedding plants quite yet but look to put Summer bulbs in pots. Use Multipurpose Compost to encourage strong roots and eliminate sourness from pots. Prepare the top soil for summer. Clear spring bedding plants and fork in Farmyard Manure or Chicken Manure Pellets. Time to start planting up those hanging baskets, tubs and window boxes ready for that blaze of colour. Leave until the middle of the month or June if it is still cold/windy. 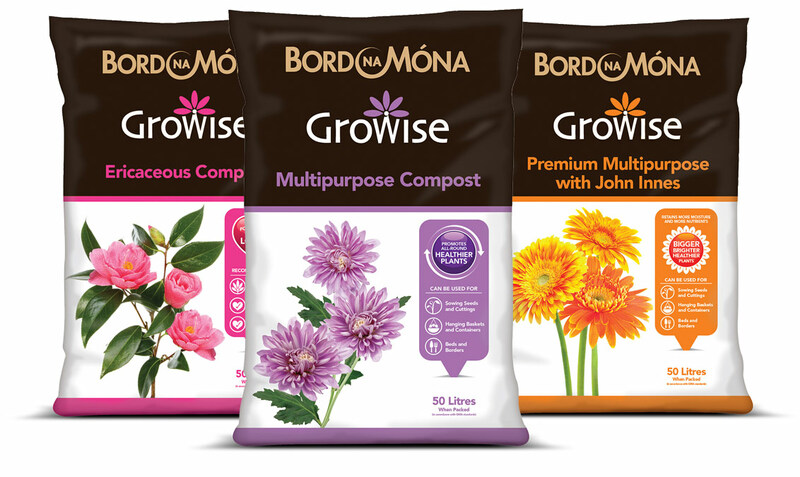 We recommend Growise’s specially formulated Tub & Basket Organic Compost or John Innes No.3 Compost – both will sustain plants longer before feeding is required. The key message here is keep on top of it all – watering is essential in dry areas, as is feeding. If you are just planting out frost-tender vegetables make sure the soil is prepared. Use plenty of Organic Farmyard Manure, Organic Garden Compost, or Organic Garden Soil, plus Chicken Manure Pellets. Remember to plant vegetables in hoed-out channels to save water and feed, and maximise the benefit. Leeks and winter brassicas will be ready for transplanting from now – make sure your new soil is ready for them. Organic Farmyard Manure, Organic Garden Compost or Organic Garden Soil will ensure the soil is invigorated and aid water retention. A sprinkling of Chicken Manure Pellets – rich in slow-release phosphate – will give the roots an extra boost. Plant out Summer bedding plants after working in Organic Garden Compost or Organic Garden Soil and water regularly. In the north beware of late frosts: you might need to wait until June! Sow more vegetables including, lettuce, rocket, spring onions, carrots, peas, beans, courgettes and sweetcorn. Harvest some of the crops you started to grow earlier. Plant tomatoes etc in Growbags or Organic Vegetable Compost outdoors to get great tasting, bountiful crops. Don’t leave the ground empty for long – before sowing the next batch work some Chicken Manure Pellets into the soil. Bring out hanging baskets and other container plants when the weather is kind and make sure they are fed with plant food. Time to sow winter and early bedding plants in pots and trays under glass. Use John Innes No.1 Compost or Seed and Cutting Compost. Note: during these long days plants grow faster and need more feeding. This is the key time to keep them topped up with nutrients. To deter pigeons push twiggy sticks in to the ground where young brassicas are growing and dangle cast-off CDs overhead. Shade greenhouse if it is open to the South. These will be ready for feeding in July (once the first flush of flowers is over). Give these (particularly late flowering ones) a Feed by working in Chicken Manure Pellets between plants and watering well. This is the season where the roots are jam packed and there is loads of great colour. Maintain it with plenty of water. As with June keep sowing those vegetables. Also sow spring cabbages around this time of year. Don’t be tempted to feed them. If you plan to create a new lawn in Autumn, – now is a good time to start digging it over and getting rid of weeds. Work in Chicken Manure Pellets to provide long-lasting organic phosphate to boost root growth and thus good establishment. Remove weeds before they re-seed and use our Bark Chips to keep them at bay. A time for finding self-sewn seedlings – you can pot them indoors using John Innes No.2 Compost to give them the best possible start – ensuring they will make a good size plant for planting out next year. Still blooming; keep up with the watering. Once you have raked out moss and removed weeds, you should spike the lawn and topdress with Enriched Top Soil. Spiking makes sure the lawn doesn’t become compacted, leaving you with poor surface drainage, encouraging moss. Organic Garden Soil is enriched with a long-lasting nitrogen sources and is high in humus to improve soil structure. Enriched Top Soil is particularly beneficial to gardens on chalky or sandy soils. Some Enriched Top Soil will fill the spiky holes – the rest will be dragged down by worms. If you plan to start a new lawn in October or November, start preparing the top soil now. If the top soil is in good condition, grass seed can be sown late September or early October. Again, we recommend Organic Garden Soil before seeding or turfing, which can be done up to November, weather permitting. Plant evergreens and conifers now or April. They will need watering until they are well rooted. Use Organic Farmyard Manure to line the planting hole and backfill soil to conserve moisture and aid root growth. Make sure you bury bulbs to the correct depth. Plant winter pansies etc. in beds or containers. Multi Purpose Compost contains oyster shell and charcoal to eliminate odours and protect young roots. Trim off dying foliage to reduce the risk of disease. Harvest your vegetables and enjoy your BBQ while you still can. Time to sow Japanese (over-wintered) onions (white or red) in Seed and Cutting Compost or John Innes No. 1 Compost. To give you onions at least one month before the normal varieties. Prick-out into John Innes No. 2 Compost or Multi purpose Compost with added John Innes. A perfect time for planting – soil will be moist and warm. The long lasting reserves of plant foods in Organic Farmyard Manure will ensure future rich green foliage next year and sustain the plant through the winter months. Trim hedges and lop trees. Shred or take to the re-cycling centre. If you have a hatchback, estate car or van, we recommend getting 1 or 2 “dumpy bags” from a builders merchant. It’s a great way to collect green waste. Sweep up leaves for your compost bin or re-cycling centre. Green tomatoes don’t have to be made into chutney! Put them in a cardboard box with an apple and you’ll spin out your supply of ripe home-grown tomatoes by several weeks – and they’ll still taste much sweeter than imported ones! Sow Broad Beans and plant garlic for early crops next year. A good time of the year to enjoy house plants – using our Multi Purpose Compost should ensure you get greener leaves and vibrant colours even if the garden has lost much of its colour. November 5th – only good excuse for a bonfire (watch out for hedgehogs!) Put bonfire ash on the garden – it’s a useful source of potash. A good time to fork over the veg plot, beds and borders- ready for new lawns, beds and ready for the Spring. It will reduce the likelihood of pests and improve soil structure – especially with heavy soils. As you turn the soil, work in Organic Garden Compost, Organic Garden Compost or Organic Farmyard Manure. For light/sandy soils, apply Chicken Manure Pellets too. Providing the soil is in a suitable state – moving these plants is best done in November and December, or in early March.